Holiday.gr - Sami, a trip to a myth! You can also swim in the beach of Karavomylos and in the gulf of Saint Paraskevi, ideal for those wanting some privacy. Sami is the land of caves. There are more than 17 caves in the region, two of which can be visited. It is the cave of Drogarati, one of the biggest and most beautiful natural sites of Kefalonia. It is very close to the sea cave of Melissani. It was discovered 300 years ago, when during a severe earthquake, part of it fell and revealed its current entrance. It has a 60m depth, while it is rather possible to communicate with other caves. The cave’s interior is full of stalactites and stalagmites. The patterns impress visitors. The cave of Melissani is the most beautiful and famous in the island. It is a cave – lake in location Karavomylos. 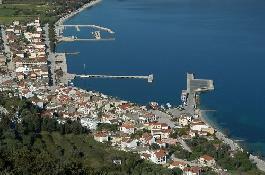 It was discovered just in 1951 by the speleologist Petrohilos and has tourist development. Part of its ceiling has fallen and has created a natural scenery. The sunlight enters and as its sunrays are mirrored in Ionian waters, they create a unique spectacle. The existence of the cave is known since ancient times. According to mythology, nymph Melissanthi killed herself by falling into the lake, when Panas refused her love. Inside the lake is also a small island, where there were found the remains of Panas’ ancient temple that foster this myth. You can tour around the cave only by boat. It has a length of more than 100m. A special boat that will be unforgettable. Sami apart from natural sites also has religious monuments. It is worth visiting the monastery of Agrilia, built on a hill right above the beach of Antisami viewing to Ithaca and Patraic Gulf. As and the byzantine church of Saint Spyridonas in Poulata village. Been to Sami ? Share your experiences!